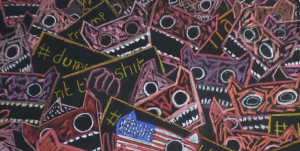 The CAT mask became an emblem of protest spread via social media in 2014. CAT masks, handmade by artist, were adopted by “owners” who travelled the world posting selfies on Facebook and Twitter #proTestbed. ! Originally conceived as a protest against the threat to demolish the maverick architect Will Alsop’s arts venue, Testbed1, in London’s Battersea, the CAT defiantly took on new themes and personae first appearing on an interactive blackboard in The Doodle Bar @Testbed1. The artist’s protest highlighting Bahrain’s oppression of opposition groups received international TV coverage ! Responding to public demand, Jane Frere created her own protest blackboard in her Highland studio, drawing on darker issues from the blitzing of Gaza in 2014 and the Scottish referendum, to messages smuggled from jailed human rights activists in Bahrain. The artist’s latest response reflects the world’s rude awakening to the rise of altRight, anti-immigrant bigotry, BREXIT and TRUMP. In solidarity with the “Pussyhat Project” for the Women’s march in Washington, Jane’s proTestbed CAT has turned pink with rage. Jane Frere’s first major international installation, ‘Return of the Soul’, received five star reviews at the Edinburgh Art Festival in 2008. She exhibited ‘Into The Void’ a series of paintings, photographs and printmaking drawn from her experience of living behind the Israeli apartheid wall and in Palestinian refugee camps across the region at Summerhall in 2013. Recently focusing on printmaking, her work, in collaboration with Will Alsop RA, is exhibited at the Royal Academy in London.